Manual HTML slideshow with next and back button can easily be used to sell products on your website. The manual HTML slideshow images are hyperlinked. 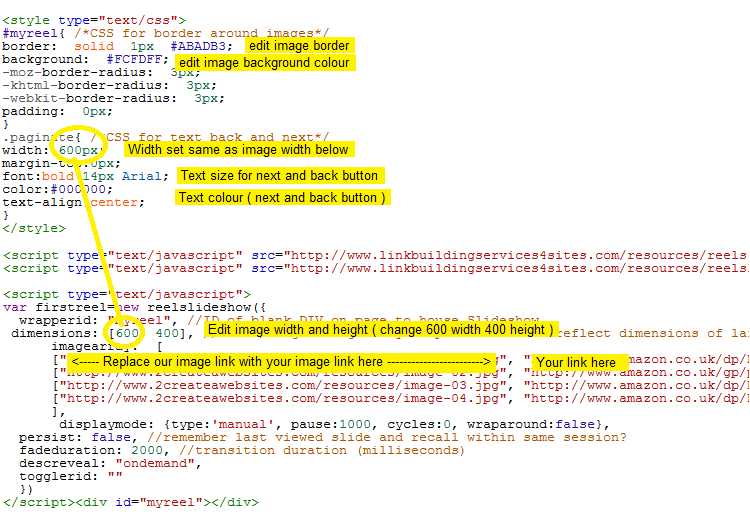 Copy one code replace with your hyperlinks, photos or images and its done. Visitors can click the next or back button and the displayed image will slide across the screen and be replaced with the next image. Try it below. How to use the manual HTML slideshow. The manual HTML slideshow demo below has pictures of cameras to buy. Visitors can use the back or next button to view the image when they want more info they click on it and a new page will open with more info on the camera. Below is the demo. Use the next and back button to move images left or right. Click on any image and a new page will open with more details. Fully adjustable you could even change the image size and the spacing between the next and back buttons. The manual HTML slide code is very easy to use when you create your own site using HTML or WordPress. Copy the below slideshow code and paste it into your site, update your site and it will be working with our stuff on. It will be the same as the demo above. All you do is follow the below tutorials on how to place your stuff on. ["http://www.2createawebsites.com/resources/image-04.jpg", "http://www.amazon.co.uk/dp/B004I1KONA?_encoding=UTF8&tag=hotocrawe03-21&linkCode=as3&camp=2506&creative=9274", "_new"]// no trailing comma after very last image element!